Get your business reports via SMS & Email being anywhere automatically. MaxxReportScheduler Booster tool auto generates and sends Email/SMS for different reports / information at scheduled duration like Daily Sales Report, Day Transactions Summary, Weekly Upcoming Payments/Receipts, etc..
MaxxReportScheduler tool is used to auto generate and send different reports without user intervention. 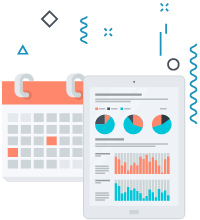 The reports are generated in the designed template format automatically on the defined scheduled time and will be sent to the Email ID/Mobile number configured with the particular report. Each report can be configured with different receivers contact and schedule timing. Different reports / information can be sent on the scheduled duration like Daily sales report, Weekly upcoming payments/receipts etc. to different department users thus enabling users to plan better and maximize their productivity. N-number of Email/Mobile number can be configured to a single report. Custom format of Email/SMS for each report. Each report can be scheduled independently with its recurrence. Know about your business being anywhere. Planning & Decision making become easy. No user intervention and no manual reporting required. Better analysis / comparison and information history logs.